Come join Santa's elf Rouscaille and a magic Donkey on an adventure around the world on a search for missing elves. 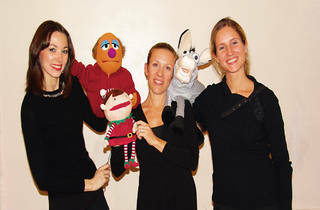 This interactive and bilingual (English and French) puppet show will teach kids about Christmas traditions all over the world with songs. Kids will get a kick out of being served like adults in this "Kiddie Kabaret" setting, while adults will feel like they are at the kids table all over again as they sit together at a table of their own. Ages 3–6.